When music plays the water fountain in these speakers sprays and dances to the music while being lit up by LED lights. It creates an amazing combined water and light show that looks particularly spectacular in the dark. When music plays the water fountain in these speakers dances to the music, all the while being lit up by LED lights. They come in two colors: white and black. For the black version click here. They are compatible with PC, iPhone, PSP, MP3 players and basically anything that has the standard 3.5mm audio port such as most smartphones. LED lights in red, blue, green and yellow light up the water in multi-color. Plugs into standard United Stats power socket or into USB ports for power. Frequency response range: 220Hz – 13000Hz (not so great, but not awful either). Inside is actually plant oil, which is safer than water when electricity is involved. The first thing with this item is that the light show is amazing. It really is a beautiful and amazing water show that looks quite nice during the day but in the dark at night becomes truly spectacular. The jets fire in in time with the music and the LED lights illuminate the entire show almost like a rainbow. 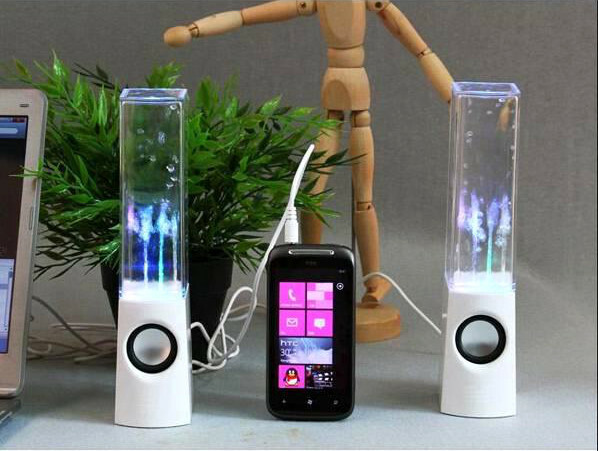 The second nice thing is that these speakers have a number of methods for plugging them in. You can plug them in directly via the power, if you use the United States power system or if you have a converter, and you can also plug them directly into a USB power supply such as your computers. This is great as it allows anyone in the world to use them really and gives multiple options for plugging them in. The first and primary issue people have had with the speakers is that they were not loud enough. 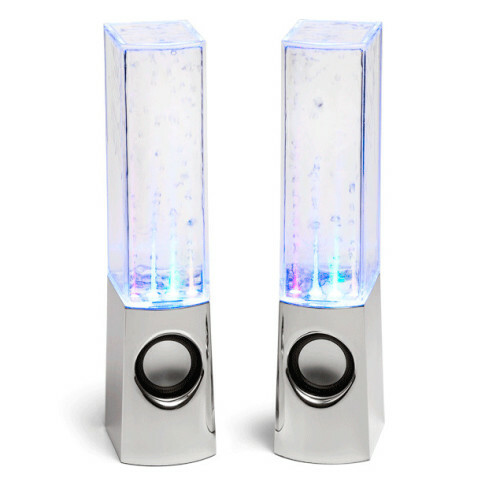 The thing to understand is that these speakers are mini-speakers with an LED water fountain light show on top all for under $50. In other words there is just a limit to how loud such small and relatively cheap speakers are going to be. The second issue is that the frequency range is not that great on these speakers. Human hearing is roughly 20 – 20000 Hz. A high quality sound system will typically out-range the human ear, but these are well within it. At the low end of the spectrum the speakers not only fail to get down below our hearing levels but they do not get to where other quality speakers get, which is around 40Hz. 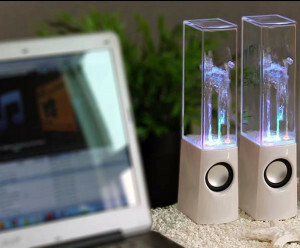 The short version of this is that the base is not so great with these speakers but that is probably to be expected given they have no sub-woofer and are under $50. At the high end of the spectrum they also have trouble with sounds above 13,000 Hz whereas our hearing can detect up to 20,000 Hz. To give some degree of reference frame for quality a good pair of Phillips Headphones for under $50 have a frequency response range of 10 Hz – 27000 Hz. This is dramatically superior and completely covers the human hearing range, though headphones are typically cheaper to make to be fair. In defense of the Watershow Speakers it is worth noting that none of these other speakers include an LED light watershow that simply looks amazing. They also do not include free international delivery (alright that was a plug from me, had to!). They are really mini-speakers, which is a point many people seem to get confused on. As they are quite a small item the sound volume and quality is limited, particularly for the quite low price point. Visually amazing and the sound quality is pretty good. Nice for the price but you can definitely get better quality speakers at a similar price point. Shipping: Free economy shipping (15 - 35 Days delivery time). Returns: 60 day money back on damaged or faulty goods.